Spring’s first fling with big purses ends on Saturday, April 26 with Yonkers Raceway’ $567,000 George Morton Levy Memorial and $371,400 Blue Chip Matchmaker pacing series finals and consolations—the ‘Levy’ for $100,000, Matchmaker for $75,000. In Ohio, soph-filly pacers battle in the Courageous Lady at Northfield on April 25. At the Meadowlands on Saturday, a $49,015 W.N. Reynolds Memorial is the earliest Grand Circuit (GC) event to date, offering soph-colt pacers a chance to be displayed before the official GC rolls in May. Hoosier Park ups the ante every Thursday night, guaranteeing a $10,000 Pick 4 over races 3 through 6 and TwinSpires is doing the same by doubling our Pick-4 bonus to 20 percent on Thursday nights.That's correct, hit the Pick 4 and you will get a bonus credit equal to 20 percent of your gross winnings, up to $500. We will be adding Hoosier to our horses to watch (H2W) list and suggesting horses during the week on Twitter @FrankCotolo and @TwinSpires. Clickhere for details. 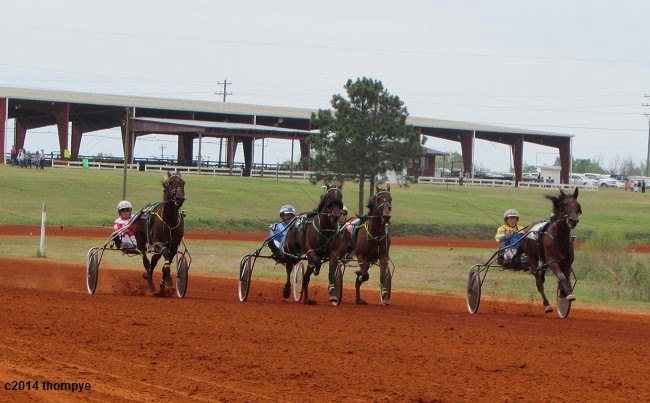 We have added a few horses to watch (H2W), on our exclusive list for TwinSpires harness blog. Use these suggested contenders that are proving productive across-the-board wagers and serve as profitable members of exotics. Yonkers Raceway presents the big event of the weekend, featuring the biggest harness-racing money earner of all time, Foiled Again, in the final of the George Morton Levy Memorial Pacing Series Saturday night. Foiled Again is looking for his third Levy title. This year, he won his first four prelims legs and put in a real stinker in the last, finishing off the board. This is how “Foiled” raced last year, also. His wins were strewn together and his losses were unexplainable. Where does that leave him on April 26? You cannot throw him out, but since Bettor’s Edge races in tandem with him as a Burke entry and P H Supercam/Mach it So race as a P J Fraley-trained entry, you are left with the best of the rest, Apprentice Hanover for a decent win price. He should good off far higher in odds than are his chances, while the remainder of the group—Saphhire City, Texican N and Dancin’ Yankee—may find the mile a struggle, while offering more in the pool than they deserve. In the consolation, no one could blame you for taking a shot with Word Power to beat probable favorite Easy Again. That one defeated Foiled last week and the crowd will favor that win, though not much a feat. Word Power won against similar last year at Maywood (we gave him to you at $15.80) and this looks like a similar spot for him to excel and so paying well. Trainer Larry Remmen has him primed after a slow start in this series. Also Saturday, April 26, the Matchmaker Final and Consolation bring together most of the six-week series’ best. From the rail in the final, Somwherovarainbow will be bet heavily and have a great advantage, even though she has had some trouble in leg divisions. Anndrovette always poses a threat and her experience among older foes needs to be respected and will be via the betting. From post 2, Yagonnakissmeornot may be a third or fourth choice, sharing one of those spots with Summertime Lea, who drew post 8. On a good night, as the legs have proven, either of these two could win. The latter races as a Ron Burke entry with Rocklamation, which will hamper the odds, and Krispy Apple won’t be wagered upon alone, being in a PJ Fraley entry. So, Yagonnakissmeornot gets our call. In the consolation, we are going back to supporting Fashion Mystery. She played out some serious trips and picked up some dough during the legs and will be a strong price in a weak field. The $110,000 Courageous Lady presents a small field of soph-filly pacers this Friday, April 25 at Northfield. One of the six behind the gate, Kayla Grace, was a $10,000 supplement to the field, becoming the 3-1 morning-line choice by track handicapper (and Executive VP of Racing) Dave Bianconi. Kayla Grace enters the event with a 15-for-15 record, a mark of 1:55.1 at Hazel Park and earnings of $69,227. All of Kayla Grace’s races were in Michigan. This will be the first time she travels for an event on the national stage. St. Charles, however, has had success outside of Michigan. Her horses (aside from 13 Michigan Sires Stake champions) have won at Woodbine and Hawthorne. The field is small, said Bianconi, because some of the fillies staked and expected to race in the race did not enter. “Two or three came up sick. I wish the field size was seven or eight, but what we lack in quantity, we have made up in quality,” said Bianconi. If there’s a big purse anywhere, expect a Ron Burke trainee to take part. Here, A La Notte Hanover is well placed (Burke places his stakes horses in fields of similar class) and has had a good prep at the Meadowlands, finishing second as a top choice. We are going with “Woman” and “La Notte” to defeat Kayla soundly. Even with the “Flying Turns” of the Northfield half-mile, which bettors may feel benefits Kayla, the class of our two choices, especially Woman, is the key to a win and at a reasonable price. The “Reynolds” starts the Early Pick 4 with Race 3 and features nine (four in two entries) lightly raced three-year-olds. It’s the first group in the division to go in a stakes contest. Two in the field did not race as freshmen and two are making their first starts off of frosh campaigns in 2013. Trainer Joe Holloway has a sharp pair with Stratos Hanover and The Lunch Pail, the former with two wins already this season and the latter strong from outside posts in Pennsylvania events. Thomas Cancelliere conditions the other entry, Frankandjoanne and Parnu Hanover. The former broke his maiden at Pocono recently and the latter hasn’t raced since last November. There should be some strong action on both of these entries. Holloway has a third horse here, outside of the entry (different owners) and coming from post 9, Always B Miki won’t be so attractive to bettors. He was bred in Indiana by a sire that raced in New Jersey with speed to spare, Always A Virgin. This one has speed and has shown an ability to come off the pace, so being young and versatile and having some experience in classy events should make him a legitimate contender here. A good price is nearly guaranteed, especially if driver Corey Callahan—a crowd pleaser in Jersey lately—takes one of the other two horses he is listed to drive. Its really nice!I like the helpful information you provide in your articles. I’ll bookmark your weblog and test once more here frequently. I’m pretty sure I’ll examine plenty of latest stuff proper right here! exceptional of good fortune for the next!i was recommended this weblog through my cousin. I’m now not sure whether or not this post is written by him as nobody else recognise such exact about my trouble. You’re terrific! thanks!